Four jailed Catalan leaders have ended a hunger strike begun more than two weeks ago, their spokesman said Thursday. 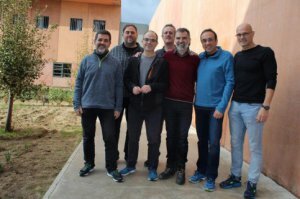 Jordi Sànchez, former spokesman for the regional Catalan government of Carles Puigdemont, and colleagues Jordi Turull, Josep Rull and Joaquim Forn began refusing food at the start of December at Lledoners prison north of Barcelona. They are being held on rebellion charges pending trial for their role in last year’s referendum which saw the wealthy northeastern region try to break away from Spain. They embarked on the fast in protest at a Constitutional Court block of their attempted appeal against provisional detention. The seven male Catalan leaders in Lledoners prison awaiting trial (Photo ACN). With the trial against pro-independence leaders due to start in Madrid in the coming weeks, a joint letter by former Catalan presidents and former parliament speakers urged the hunger strikers to stop the protest in order to save their strength for the proceedings. ‘The decision to stop their hunger strike was taken as they consider their objectives have been obtained – that is (their situation) has been taken into account and shaken the Constitutional Court into responding to their appeals,’ their spokesman said in Barcelona. The Court has thrown out appeals against their detention and the suspension of some of those jailed from their posts as regional lawmakers. The quartet’s spokesman said following that rejection the four will now take their case to the European Court of Human Rights (ECHR). The hunger strike by jailed pro-independence leaders was widely reported by international media, and some members of the European Parliament sent a letter to Pope Francis urging him to mediate in the Catalan crisis and bring ‘hope to the Catalan political prisoners on hunger strike’. In all, 18 pro-indpendence lawmakers face a trial due to start in Madrid early next year. Prosecutors want a 25-year jail term for former Catalan regional vice-president Oriol Junqueras, also detained at Lledoners. Puigdemont, who fled to Belgium in October last year, is accused of rebellion but will not face trial in his absence. Spanish Prime Minister Pedro Sánchez will Friday hold a cabinet meeting in Barcelona amid tight security as Catalan pro-independence groups plan to protest and block roads. The meeting comes a year to the day after Madrid held snap elections in Catalonia after blocking the region’s independence bid.